Meet the marinara sauce recipe of my dreams! I’ve always been intimidated by marinara, maybe because I love it so much that I was afraid of messing it up. I finally faced my fears and tried making marinara every which way. This version is my favorite, no contest. This homemade marinara sauce offers rich and lively tomato flavor. 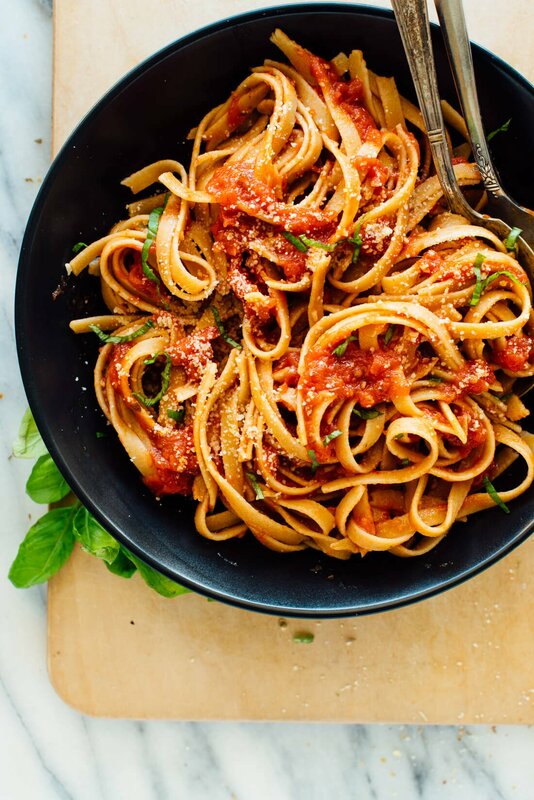 You’ll need only five basic pantry ingredients to make this delicious marinara sauce: good canned tomatoes, onion, garlic, dried oregano and olive oil. That’s it! 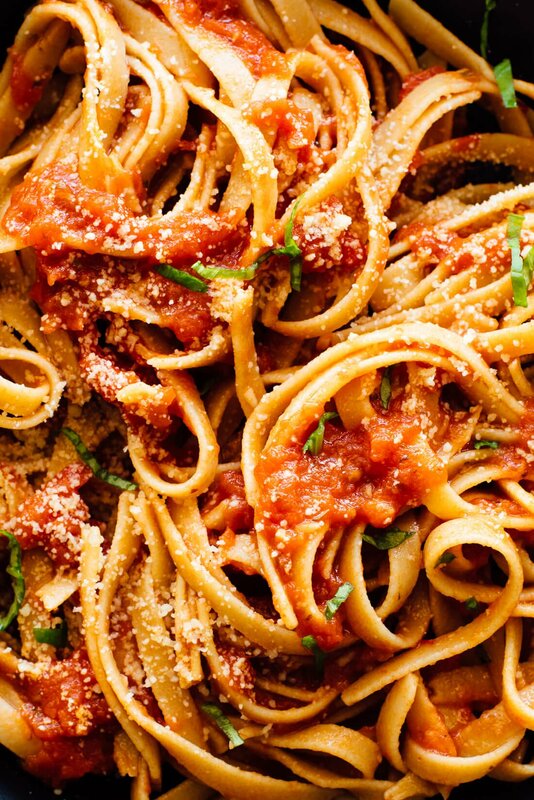 This marinara is exceptionally easy to make, too, so it’s perfect for busy weeknights. You don’t even have to chop the onion and garlic. 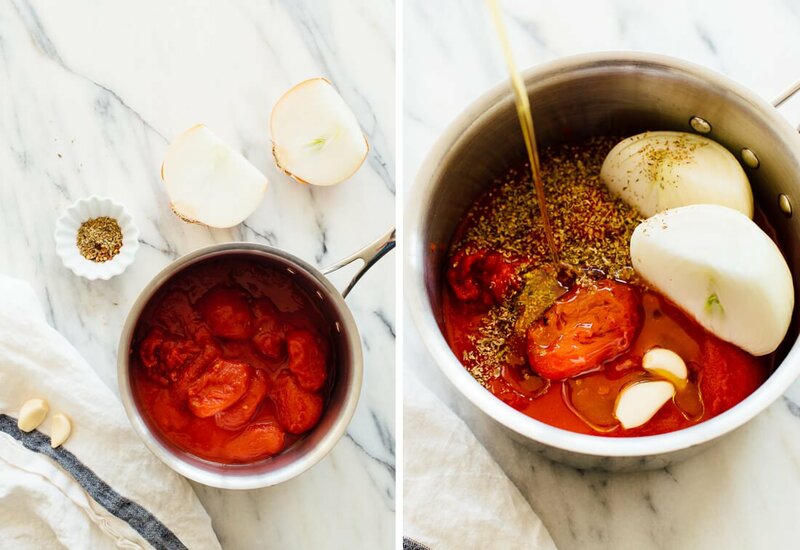 Yep, that’s right—just crank open a can of tomatoes, halve an onion and peel some garlic. You’re ready to go! This sauce offers lovely, authentic Italian flavor after a 45-minute simmer. I tried to take shortcuts to make it even faster, but no amount of tomato paste, spices, salt or sugar will make up for lost time. Bottom line: It’s impossible to achieve enchanting, long-simmered marinara flavor in under 45 minutes. So throw those ingredients in a pot, pour yourself a glass of wine and boil water for pasta. Dinner is almost ready. After trying many variations on marinara sauce, I adapted this recipe from Deb’s tomato sauce with onion and butter, which was originally sourced from Marcella Hazan’s 1992 cookbook, Essentials of Classic Italian Cooking. I love that tomato sauce, but it doesn’t pass for marinara since it’s missing herbs, garlic and olive oil. So, I added dried oregano and two whole cloves of garlic (which you’ll smash against the side of the pan at the end). I traded a reasonable amount of olive oil for the butter (you really don’t need to use a ton of olive oil here for rich flavor). I also added a pinch of red pepper flakes for a little kick, but those are optional. Why is this the best marinara sauce? This marinara sauce recipe requires 5 basic ingredients and yields rich, authentic marinara flavor. It’s super easy to make—no chopping required. Unlike most store-bought sauces, this marinara is free of added sugar. You can load up your pasta with as much of this wholesome sauce as you’d like. Tomatoes are good for you! The recipe yields two cups of sauce and freezes well, so you might as well double the recipe. Just cook it in a bigger pot. 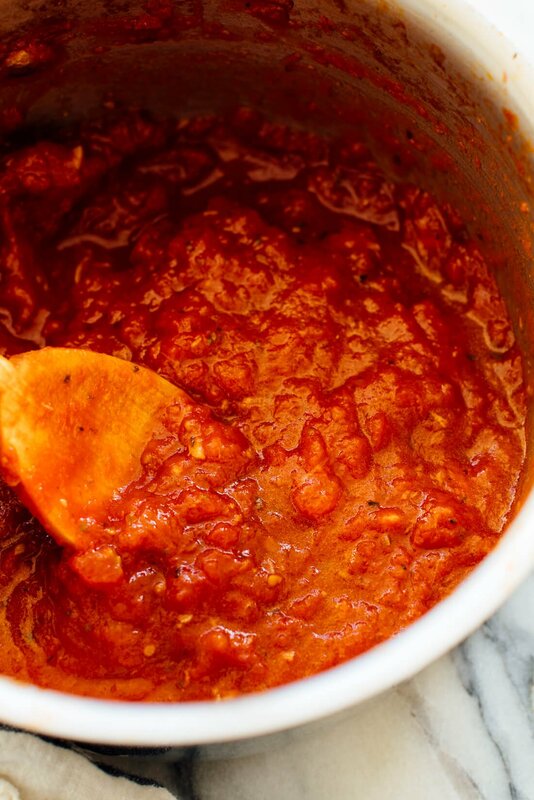 This marinara also makes an incredible pizza sauce. I made pizza with it and my friend remarked that it tastes like real-deal Italian pizza. Please let me know in the comments how you like this sauce! It’s a new staple in my kitchen, and I hope it becomes a go-to recipe for you as well. This marinara sauce recipe is the best! You’ll only need 5 basic ingredients, and it’s so easy to make. No chopping required! Recipe yields 2 cups sauce (enough for 8 ounces pasta); double if desired. 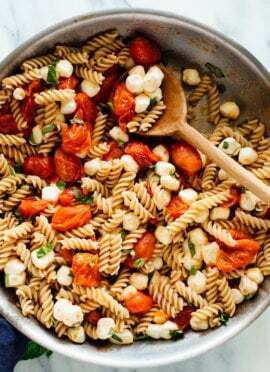 In a medium, heavy-bottomed saucepan, combine the tomatoes (with their juices), halved onion, garlic cloves, olive oil, oregano and red pepper flakes (if using). Bring the sauce to a simmer over medium-high heat, then lower the heat to keep the sauce at a slow, steady simmer for about 45 minutes, or until droplets of oil float free of the tomatoes. Stir occasionally, and use a sturdy wooden spoon to crush the tomatoes against the side of the pot after about 15 minutes has passed. Remove the pot from the heat and discard the onion. Smash the garlic cloves against the side of the pot with a fork, then stir the smashed garlic into the sauce. Do the same with any tiny onion pieces you might find. Use the wooden spoon to crush the tomatoes to your liking (you can blend this sauce smooth with an immersion blender or stand blender, if desired). Add salt, to taste (the tomatoes are already pretty salty, so you might just need a pinch). Serve warm. This sauce keeps well, covered and refrigerated, for up to 4 days. Freeze it for up to 6 months. *Tomato note: Using high quality tomatoes is key here. I recommend Muir Glen tomatoes. They’re organic and the cans are BPA-free. I’ve been making the original recipe your linked for years (with the butter) and it’s my favorite sauce! At the end I throw the softened onions and sauce in the Vitamix and pulse, no need to waste the onion. I also add herbs to it because I like the taste better. Perhaps I will try your healthier version sometime! Seems that this might be a great candidate for the Instant Pot–cutting down on the 45 minute time. Have you done anything with the Instant Pot? That’s an interesting idea! I have been playing with my Instant Pot but I can’t say I love it yet. I’m not sure if the amounts offered here would be enough for the Instant Pot. I’m also not sure if it would cook much faster once gaining/releasing pressure are taken into account, but please let me know if you try! I would probably use a double pot method if using the instant pot. I plan on making a lasagna and needed a marinara recipe. If I remember, I’ll respond back on how it works. An even healthier option is using a spiralizer to make zucchini noodles instead of using regular pasta. Why use the halved onion instead of chopping the onion? It’s just saves a bit of prep and cooking time, making this a VERY easy throw-in-one-pot situation! Seems like this one would do well in the slow cooker? Do you agree and if so what timing and setting (low or high) would you recommend? I think it would! I’m sorry, though, I don’t have much experience with slow cookers. If you can find a slow cooker marinara recipe, I would pull timing/temperature recommendations from that. 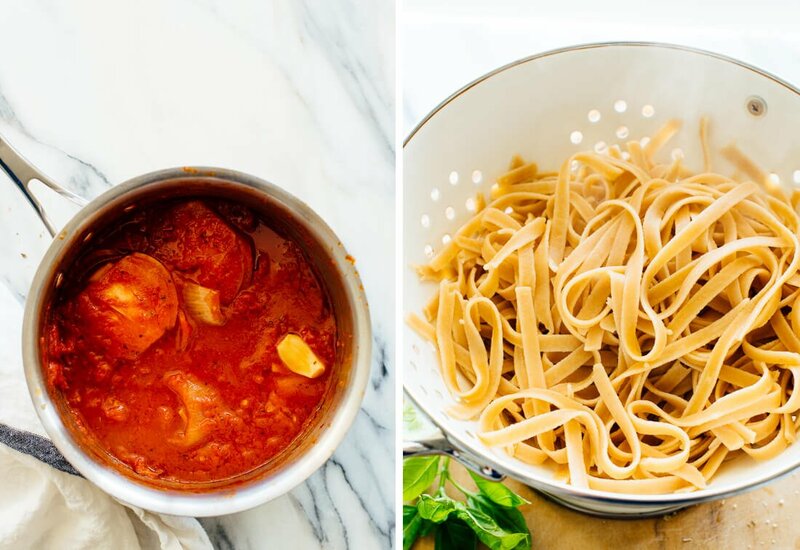 Homemade marinara has always intimidated me -but this recipe looks so approachable! I cannot wait to try it, heck maybe tonight, I have all the ingredients in my pantry already! I know! It can be. Let me know what you think, Aimee. This looks great! I always make up tomato sauce in my vitamix if we do pasta rather than eating the sugary jar kind. Question – if we blend it after the simmer, do we leave the onion in or still take it out? Thanks! I’m trying to remember if I removed the onion before blending in my Vitamix or not. I think you’ll be ok either way. Please let me know if you try with the onion! I just made this – had everything on hand! I had to use 2 cans of diced tomatoes and added some dried basil. Used an immersion blender at the end. It is delicious! SO simple. Will use with pasta this evening! Thank you! You’re welcome! Thank you, Kelly. Do you have any idea how to make this using the healthy new invention called the instant pot? Good question! I’m not sure if the amounts offered here would be enough for the Instant Pot. I’m also not sure if it would cook much faster once gaining/releasing pressure are taken into account, but please let me know if you try! Pasta sauce, in general, has always made me nervous, but I recently learned how to make a great Pomodoro sauce and now I can’t wait to try others. This marinara sounds perfect! Let me know what you think, Aimee! It’s on the stove right now, but I have a question, why would you discard the onion after it’s simmered for 45 minutes? It has good fiber and flavor. I’m going to try it first and blend the onion in with the rest, then I’ll try the recipe again and take it out. I imagine you are going for the stronger tomato flavor if it’s not diluted. I’ll let you know what my little experiment shows! For this, it is about infusing the sauce with flavor. You can blend it if you like, but it may not be as much of a sauce. But I would love to hear how it goes! I had it on low on the stove, and stirred it occasionally and it ended up cooking for a couple hours before I got back to it. I used my own canned tomatoes from last year’s garden. The onion had melted into the sauce by the time I was ready to make supper. I blended it with an immersion blender just to get rid of any big pieces of tomato or onion. It was superb! My tomatoes were so tart, I added a tsp of sugar, for balance. I definitely recommend not adding salt till the end, since simmering it down ended in a sauce that was just right, no extra salt needed. I certainly didn’t feel the tomato sauce flavor was diluted at all by leaving the onion in. But if I were to try it the traditional way and remove the onion, I’d turn right around and chop that onion into a nice breakfast of huevos rancheros!! I bet the 45 minutes is SO worth it! Sounds great, but what can you do with the onion, or is that simply discarded? You can just discard it. You just need it to infuse the flavor. Hope this helps! My daughter and I both make this every Monday! I could drink it like water! So very good! I’m glad you like it that much! Kate – this sounds like a great recipe! Can’t wait to try it. Do you have any suggestions for other uses for the onion rather than throwing it out? Let me know what you think! The onion will be pretty well cooked and infused with the other flavors. I know some have mentioned dicing it and adding to whatever they are serving with the sauce. I haven’t tried that though! I have made some of your recipes and they are great, like the enchilada sauce…so good. However, being Italian, I can’t make a marinara sauce without chopping the garlic to bring out its flavor, adding chopped fresh Italian parsley, dried oregano and basil. A tsp of sugar or grated or whole carrot also helps control the acid. Sometimes a little half and half will help if the sauce still has that raw flavor.. If time allows I like to roast tomatoes, eggplant and zucchini for a pasta primavera sauce. God, I hate it when people comment and try to change the recipe being offered. Believe me, I’m not trying to do that. Just giving other options. You can delete this if you want to. This looks great. It’s going on my todo list. Thank you so much for a marinara sauce without sugar in it! I use marinara sauce on steamed broccoli and cauliflower. You’re welcome! Sounds like a great way to use it. Thanks for sharing, Marsha. Marinara sauce is my absolutely favorite! It goes well with even the most interesting foods–toast, stir-fries, on top of a stuffed sweet potato, rice, potato wedges, salad greens, and savory pancakes or waffles! Sounds weird, but don’t knock it until you try it! Interesting combinations! I’m going to have to try some. Thanks for sharing. I have a question please. Can I use fresh tomatoes instead of canned because I am trying to avoid all canned products. I am wondering the same thing!? Has anyone tried with fresh tomatoes? I’m drowning in them right now! Belated reply on fresh tomatoes: I have not tried them in this particular recipe but I’ve used them with success in the past. I’ve found that they work best when peeled and seeded first to reduce the funky texture from those parts as well as control bitterness. If you have beefsteak (juicy) tomatoes you may need to simmer longer to evaporate the extra liquid. How many tomatoes (approximately) would you substituting fresh tomatoes? Planning on growing some this year to can and make sauces like this! This looks amazing, I love all your recipes! 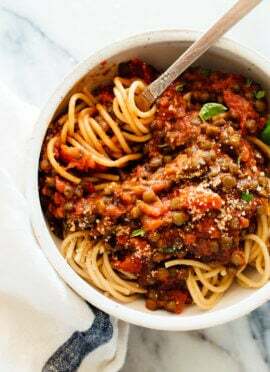 My husband loves lentils so I know he will be all over this, I am going to sub the pasta for spaghett squash, but that’s my only change! Great! Nice to hear your husband loves lentils. Win! Love to hear what you think after you give it a try. With the instant pot, it isn’t necessarily the time saved, though often time is saved. For me, the real beauty of the IP is that once turned on, there is no stirring, watching or other fussing. I can focus on other aspects of the meal. If one wanted to saute first, it could all be done in the instant pot. There is a marina recipe in the IP Electric Pressure Cooker Cookbook that is good and very similar to yours, but I want to try yours. It seems that I could use the timing/pressure in the cookbook with your ingredients. High pressure for 30 minutes and a 10 minute natural release. I hope this helps others who want to use the IP. Thank you, Debbie for sharing! I really loved this recipe! Pasta with marinara sauce is probably my favorite meal of all time so this was super fun to try. The sauce is really tasty and I liked using whole peeled tomatoes. My mom makes a great bolognese sauce using ground beef and red wine. I added vegan “crumbles” to make it more like bolognese and that made it very filling. I’d like to try adding red wine next time to make it even more flavorful than it already is. This is definitely a keeper, thanks! You’re welcome! I love you adding your own twist, Abbie. I made this recipe for dinner last night and it was SO good! I appreciate the fact that it is SUPER SIMPLE and doesn’t consume my time with chopping and searching for a variety of different ingredients. I removed the onion after cooking, as stated in the recipe, then blended it up in the Vitamix as I do not have an immersion blender. It was perfect! Next time I will make a double batch and store the extra in the freezer for when we are short on time during the week. Not a week has gone by where I do not refer to Cookie+Kate or Love read Food for a meal. Thank you again for another wonderful recipe! Thank you! Love that the blog and cookbook are go-tos for you. Makes my day! Hi Lisann – I’m sorry it’s not showing. I will take a look at to what is going on! Hi again! The nutrition facts are finally displaying as they should. I’m sorry for the trouble and won’t bore you with the technical explanation. I just finished making it, and tasted a spoonful. Scrumptious! I’m not going to bother blending it smooth, because I like the bits of tomato in it. My husband and I are going to have spaghetti for supper tonight. After tasting the sauce, I’m tempted to have an early supper. I have one question, though: why did you substitute olive oil for the butter in the original recipe? Hi Margaret, I’m so glad you both enjoyed the marinara! I was working from a buttery tomato sauce recipe and wanted more of a classic marinara, so I used olive oil instead since that is standard in marinara sauce. Hope that makes sense! I made this on the weekend, froze it in small jars, then thawed a jar and used it tonight as pizza sauce. Kate. What’s Italian for “you are amazing”?? Absolutely delicious, much better than my usual sauce! Spread it on top of a crust made using yogurt, flour and baking powder and used San Marzano tomatoes (a little pricey, but they really do make the difference when tomatoes are the star as they are here). It’s officially my go to pizza sauce recipe. Grazie, Kate!!! Rose, you are so sweet! Thank you. Wonderful. Ive made something similar. Yours adds the onion and is so simple. Love it. 4 cups of fresh spinach. Did use Muir whole peeled tomatoes. Made a big difference to me in flavor. 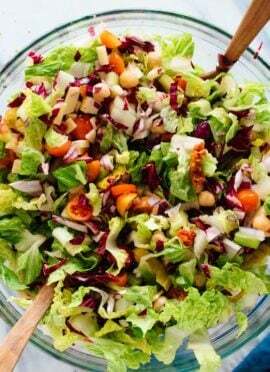 Healthy, easy and so delicious. So I pride myself on my homemade sauce (much garlic, white wine, san marzanos, salt, sugar, pepper, maybe basil–it takes some time) and my husband swears by it. Been making it for years now. It’s the stuff of dreams. I didn’t think it would work without the sugar but it does–it seems to me that simmering it in the onions gives it lovely warmth (and I do like taking them out at the end–plenty of richness instilled by the time they’re done). Only difference would be my garlics (confession: I used three) weren’t quite smashable by the end so I simply picked them out and chopped and smashed them (rather satisfying cause they’re soft at this point) then plopped them back in. I also added a good bit of salt and used Cento San Marzino tomatoes). And it truly took FIVE MINUTES to get in the pot, yet yielded a warm, savory, cozy homemade sauce I wanted to eat with a spoon. Hi Kat! I’m SO happy to hear it. This one took me awhile to figure out. Thanks for sharing and for your review! One thing I noticed: if you don’t plan to blend the sauce, it’s helpful to look for a brand of whole tomatoes that doesn’t have citric acid added in. I read once that the citric acid is used to help the tomatoes keep their shape, and I found this to be true in the second time I made it! The tomatoes did not break down as well and were harder to smash, so I used a blender at the end. I’m making this recipe again tonight, and plan on leaving it gooood and chunky :) Kate, this sauce is outstanding. Thank you! Thank you, Brianna for the comment and review. Made it tonight and loved it. Pure and simple and compliments exactly some fresh linguine, a green salad and a good glass of wine. Glass of wine I think is a must with this! :) Thank you, Ann for sharing. Delicious recipe Kate! I followed the recioe exactly and it turned out great. Thank you so much! Thinking of roasting the garlic first…opinion? I am excited to try this and excited to taste before ridding the onions. I would ultimately love to blend at the end. I am putting this over chicken parm and angel hair. Wish me luck! I’ll be making this again!! So easy. I used my heirloom canned tomatoes, fresh oregano, basil & small sprig of lemon thyme…wow. Sorry I only used a quart of tomatoes. Delicious and easy! Wonderful! All those fresh ingredients, delicious. Make sure you adjust the amount for herbs when using fresh, but I’m guessing you did. Loved the sauce!!! The only changes I made was to use crushed tomatoes vs whole, because that’s what I had on hand. The sauce turned out Excellent! It’s a keeper! I’m happy to hear it’s a keeper, Susan. Thanks for the review! I love this simple recip, and use it often. Made this for the first time last week and will be making it again today! So easy, love that it doesn’t have any added sugar, and super flavorful. I ended up throwing half of the onion in the blender with the sauce and it made it more chunky but still delicious! Thanks for sharing, Megan! I appreciate the review. I live in a 600 square foot apartment and your sauce is simmering in my kitchen making the entire Place smell like onions and garlic. I will be mixing the sauce with some pasta and bringing it to a potluck synagogue beach party at 5! Sounds amazing! Thanks for sharing and for your review, Lisa. Loved this sauce!!! Thank you for sharing! You’re welcome! It’s so good. I appreciate your review! Added a handful of spinach, a diced carrot, cut half the onion up and will leave in the sauce, will used the other half in your sloppy joe recipe tomorrow night. I made this marinara sauce tonight, and it tasted a little bland to me – adding some sea salt and twists of black pepper at the end made it perfect! Don’t be afraid to season well! So delicious, and I know it will go perfectly over whole wheat pasta – knowing me, probably with some sauteed onions and mushrooms and spinach, too. Or maybe, since it’s September, over some spaghetti squash! This recipe was so easy that I even made a pan of brownies while it was simmering. Winning! If i’m planning on doubling or even tripling this recipe, do you think I would need to add in more onions? I would increase by the same ratio. So double, then use two onions. I absolutely love this marinara sauce. Using these same ingredients, I make this in a small crockpot about twice a month. I’ve added fresh shredded basil this summer as I have it growing in the backyard. It’s a delicious and meatless meal our entire family enjoys. Thank you, Kate!!! Oh, I love garden-fresh. Thanks, Ronda! Can it be fresh tomatoes? That would be a different recipe, Nora. Sorry! Different cooking time, etc. I know others have used canned tomatoes from their garden. Can home canned tomato sauce substitute for canned whole tomatoes, if so what measurement of homemade sauce? Hate the idea of throwing away the onion. Any thoughts of omitting it or dicing it and adding it as a ingredient in the marinara? I believe others have tried that! I prefer the wonderful flavor it adds without the chunky consistency. Clicked the nutritional info , nothing appeared. I’m sorry to hear that! Make sure you allow cookies so the plug-in will be accepted by your browser. I hope this helps! I’m a big fan of Italian food and have wanted to try marinara sauce since a lot of time..but they all were so complicated and put in the studying pressure and there u go. But it’s is so approachable and “I-just-want-to-do-it-now” type of recipe. Thank you so much for sharing it with us. Keep doing the good work. Thank you for a wonderful recipe, we are a fussy bunch over our pasta sauce and to find one we all like is rare. Missed out flakes & salt and we also blended it. After taste test got a thumbs up we have decided to double up in future so we can freeze some for meatball subs. Also loved the halved onion as we don’t like a lot of it. Nice belly warmer on a cold and wet Scottish evening. Do you cover while simmering? Loved the recipe. My 1st time even trying marinara ssuce. Didn’t know it was so easy. I only had 2-14.5 oz cans of stewed tomatoes and a red onion. I emulsified the onions in a mini chopper and put half back in the sauce It worked and came out very delicious. Looking at the comments I will definitely try some of the suggestions. Ate the sauce over spaghetti squash. I don’t usually read a recipe with a long intro but I was intrigued. I made this exactly as written except I added a small amt of sugar to offset the acidy tomatoes. It was great over spaghetti! As an Italian woman married to an Italian man I am embarrassed to see I have never been able to make a good sauce…until now! I followed this recipe exactly and it is so delicious! I did not put it in a blender afterwards and it was just perfect. Served it over Dececco linguine and it was so great! Highly recommend! This is wonderful to hear, Crystal! Thanks for sharing and recommending this recipe. I made this marinara sauce today. I purchased the tomatoes that you recommended. The only problem was that I purchased diced tomatoes. This was “by far” the BEST sauce I have ever made. I used it to make pizza. It tasted just like Domino’s Pizza. You’re welcome! I’m happy it still turned out well for you. This Maranara sauce was fantastic. My kids and I all loved it. Thank you so much for sharing this simple but tasty sauce! Wonderful to hear you are loving the recipes, Ami! Thanks for sharing. I made this recipe and it came out perfectly! This is now my go to marinara recipe. As an Italian New Yorker that grew up on pasta I am so finicky about tomatoe sauce but this taste authentic and perfect. Thank you for sharing!! The onion halves joined my other vegetable scraps (carrot and parsnip peels, onion outlayers, dark green parts of leeks, parsley stems,… previously rinsed) in my freezer: when the bag is full, I use it to make some vegetable broth (just adding some garlic and thyme). Why waste? Sounds like a great idea, Nathalie! This is the best recipe of all time and I’m never making marinara any other way ever again. THANK YOU! It’s so good! I’m happy you agree, Lindsy. It was easy but the flavor was ok. It could be I used fresh oregano sprigs instead of dried ones. Addind a little bit of butter with salt to taste enhance the taste. I will add more fresh herb next time. Refused to purée the sauce for the chunky tomatoes. Served with homemade beef fennel seed meat ball. It turned out to be a nice home cook meal. Anyway, it is far better than any store bought jar with fun of making it. I’m sorry you weren’t in love with the flavor! Fresh vs dried can really impact it. Thanks for sharing, Jodi. LOVE, LOVE this recipe. It was so simple was uncertain cd be good. Made it first just yo test now Making it again it is a keeper! Thank u! 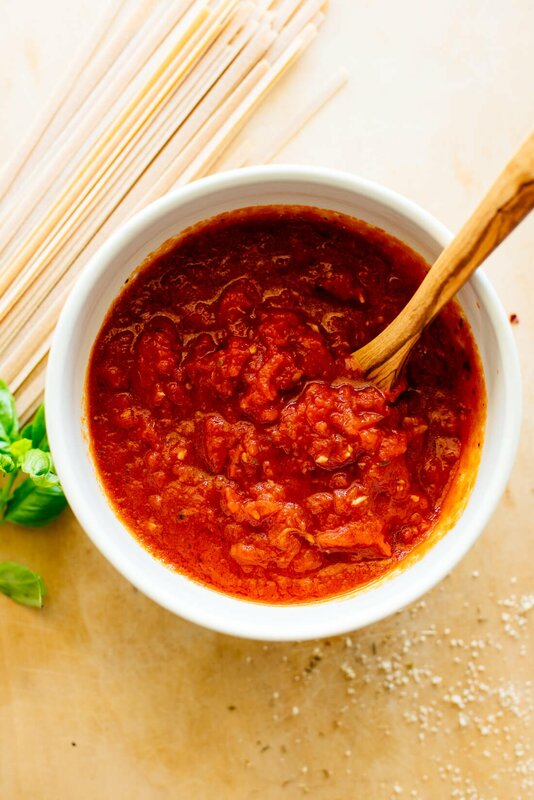 This is such a simple and flavorful marinara sauce. My house smells so good when it’s cooking! Another one of your delicious recipes. Please keep them coming! Made this with canned tomatoes…simmered as per directions. I poured entire pot into my Vitamix and blended for about 15 seconds. The sauce came out creamy and a pale orange in color, resembling a vodka sauce. It only made enough for 3 servings as it was quite thick. It definitely needed salt and more red pepper to give it flavor. My husband questioned what I was serving him, as it definitely did not look like my usual pasta with marinara. He ate it and said it was good, but not sure if I would make again. Hi! Did you blend the onion as well? I did…I blended all of the softened onion pieces after simmering for at least 45 minutes. Native NYer with not a drop of Italian heritage, but raised around Italian food all my life. I couldn’t believe this recipe when I first saw it and thought that the results would have to be subpar. But as soon as it got cooking I realized that everything was going to be okay because it had that amazing aroma. I followed this recipe to a tee with one exception. An Italian grandmother once imparted to me the absolute importance of SUGAR to bring out the flavor of the tomatoes. It goes against my grain to add sugar normally, but I really think it is the right thing to do: just 1/3 tsp. I buy Redpack whole, peeled tomatoes which now also are BPA-free, if not organic. Great recipe idea. Thanks. I’m glad it worked for you and passed your test, Tom! Thanks so much. Hi Hazel! I’m sorry you can’t have those. I’m not sure on a replacement based on your dietary needs. You can leave out as desired or use a good substitute in the same family. Leeks can be good onion substitutes sometimes. It depends on the recipe. YEAH!!! This is really good!! I added mushrooms and blended them right into the sauce. I wish I made more! It all went! Saving this for later for sure! Thanks for letting me know you loved it, Michelle! really nice sauce, i added a bit of paprika to make it more smoky and it came out great. I’m happy you enjoyed it, Ben! Thanks so much for your review. I put olive oil to cover bottom of pot, throw in a bunch of sliced garlic and and saute till lightly brown then put in a can or 2 of tomato sauce and some chopped Basil..mix well and simmer for one hr..that’s it!! I’ve made it 3 times. The second time, I left the cover off and it turned out too thick. The third time it was bitter but pretty sure it was because I used a different brand of tomatoes. Overall, I love it! Tomatoes can vary! If it’s a little more bitter, try increasing your salt or a touch more olive oil to help balance it. Thanks for your review, Linda! Do you use both halves of the onion in the sauce or just one? Thanks! You use both. :) See the process image for reference in the post. You could add a little salt to taste to help balance it. Thanks for the great and simple recipe! I just made it. I lived abroad with an Italian friend and she taught me how to make a fantastic marinara sauce. It was basically very similar to this recipe, except the secret was to add a few Tbsp of butter at the very end of cooking time. You don’t need to choose between butter and olive oil, use both! I now add Earth balance vegan butter to every marinara sauce and it makes it absolutely delectable! Thanks for sharing that you liked it, Rebecca! I just finished making this sauce… it looks and tastes amazing. I couldn’t believe how easy was to bring it together. Never thought of throwing all ingredients and leave them in the stove….well … I checked it every 15 min or so : ). As other readers, I did keep the onions and blended them. My kids prefer a less chunky sauce. I also added some fresh basil. It turned out great. Thank you for sharing, Abigail! Better than store-bought sauce. I live in the woods and ran out of spaghetti sauce and marinara… Not driving to town today! I’m so glad you liked it and had everything on hand, Sharon! Thanks so much for your review. I love to hear that, Meg! Thanks for your review. I made this sauce tonight to use in making lasagna. I love this sauce! I did put a small amount of red pepper flakes in it after tasting it. I love it! Thank you for sharing and for your review, Nancy. Just made your marinara sauce recipe. Really,really good and so simple. I have tried for years to perfect it and thanks to you – Eureka! Eureka! I agree. :) Thanks for your review, Glynn. I am blown away by how delicious this simple recipe is. I like to crush the tomatoes by hand when I am adding them. Next time I definitely doubling or tripling this so I can freeze the leftovers! I’m so happy to hear that, Jackie! Thanks for trying it and letting me know you loved it. In you recipes you list the vitamins, the last one is always the “K” vitamin. What would I have to leave out of any of your recipes so there would be no Vitamins. I ask this question because I take a blood thinner and the “K” vitamin works the opposite of the blood thinner. Hi James, this really just depends on the recipe and the ingredients list. Sorry I can’t be of more help! This is a vitamin in a lot of greens and vegetables. I’ve been looking for a good sauce recipe for a while so i’m happy I found this one. I found it a bit salty even without adding salt but I think it’s the tomatoes I used. Try to use no salt added tomatoes next time, or reduce the salt used. Thanks for sharing, Vanessa! I was looking for a nice, simple but tasty tomato sauce for my lasagne and this seemed to hit the mark. I was amazed just how it all broke down within the 45 mins to develop into a lovely rich flavoursome sauce – thank you Kate! I love your website, by the way …… thanks for sharing your recipes. You’re welcome, Janet! Thanks for your review. I LOVE this recipe! I like infusing the sauce as opposed to chunks of onion – no matter how finely dice – to each their own. One question of clarification: Double everything? Aromatics, seasoning and all? IN other words, double the tomatoes and need to double all the rest…Thanks! I’m an experienced cook and this is a lovely marinara sauce. Absolutely delicious and shockingly easy. As with any marinara sauce, using good quality tomatoes (like Muir Glen) is key. Will be my go-to marinara sauce from now on. How many tomatoes are in a 28 oz can? I have my own fresh tomatoes to use. Hi Misty! I’m not sure as it goes by weight. Sorry to not be more help. I would try weight over number. I loved this recipe! I used it in a great vegan lasagna! I used a 28 oz can and a 14 oz can of whole tomatoes. I used a whole onion in the sauce. When I blended it I removed 1 of the onion halves and kept one in the blender. It was great! I did not add any salt or pepper to the marinara either, and I let it simmer for at least an hour. Thanks for sharing, Paris! I’m glad you loved it. For very, very little effort, the payoff was to the moon! My kids were going in for thirds :) It was a little easier for me to cut the onions first, and then mash the garlic later. I also add more oregano to my taste and basil. Kate, was this recipe on your app? I have your app, but couldn’t find it, but it also could be user error (ahem, me). I’m glad you like it! The app only has the top 100 recipes from the blog currently. But thanks for the feedback! So delicious and simple! My picky kids even loved it. I blended it so there were no chunks per kids preference. I will absolutely use this as my marinara from now on. Thank you for your review, Emily! Omg I am in love with this sauce. My 3 year old who always ask for pasta with no sauce saw that we all enjoyed it that she decided to try. She loved it. I finally found THE best sauce. I have to double the recipe because my husband and 2 toddlers kept asking for more. I love that your kiddo loves it too! Thanks for sharing, Karin. I have been happily making this recipe for the last few months – love the recipe and love making it, so easy and pure. My own tweaks have been to add some chilis (small amount) and cinnamon (for that counter sweetness). For now, I am wanting to avoid/lessen my overall oil intake and wonder if you think I can do this recipe justice (health and taste wise) WITHOUT the oil? I like that you have been making your own variation! The oil really helps to add to the richness. It took me a long time to get this one right, and this the oil really helps make it.